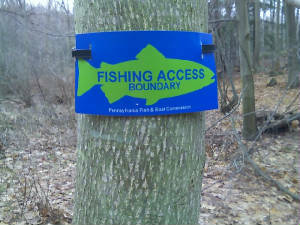 Pennsylvania Steelhead fishing for all ! Is Range bailing out of one of the most productive shale plays in America? On Saturday, July 28th the PSA held and east side stream improvent project on 12-mile creek. There was a tree that blew over about 3 years ago and caused problems with the stream flow. An island formed down stream of the cement wall and caused significant erosion. The tree limited the progress of steelhead migration up stream.